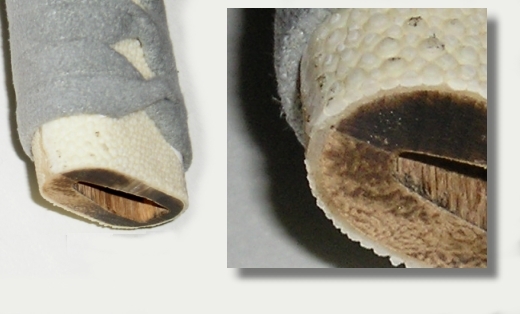 Earlier this year, I received an order for a new 13" tsuka to replace the original 10" tsuka, which was in disrepair. Along with his request, the client had included a new tsuba and new fuchi/kashira/menuki and synthetic leather ito. Before sending the new tsuka, I surveyed the original and decided that, aside from the frayed ito, it was in excellent condition. Liking the shape, feel, and size of the original, and having a little extra ito, I decided to rewrap it as a bonus... I hope the owner won't mind. Here is a pic of the rewrapped original. As for the new 13" tsuka, I carved it and put a full wrap of same' with the edges overlapping on the "ha" section to the tsuka. This was at the request of the client, the overlap itself is off center from the seam in the tsuka wood. I also extended the same' under the fuchi for additional strength. The ito used was very interesting. 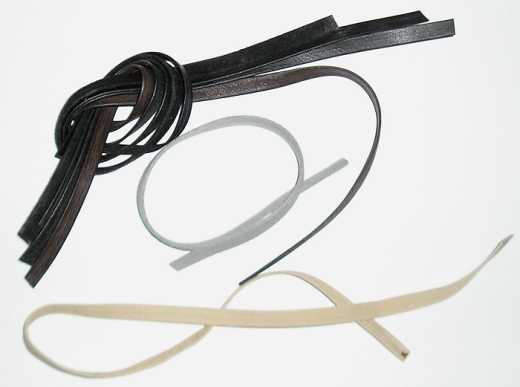 It is a synthetic leather with a nylon core. It felt comfortable yet strong, and it was very easy to work with. Below are some samples sent me by Fred Lohman. Anyway, here are a couple of pics of the finished product. Sorry about the full length view, the camera's flash kind of washed out some of the color. Like I said before, this has a very comfortable feel and was easy to work with. This being a sword for kata and tamegashiri, so I am interested in how it fairs after regular use. If you have used this ito for wrapping, or have practiced with a sword that has this type of ito on it, please let me know know how it holds up. The only other thing I did, aside from the new tsuka, was to fit a new tsuba; on the left is the original silver tsuba, and on the right is the one that I refitted. In closing, I am still debating whether or not I should use synthetic ito on older Nihonto, even if a client requests it... I tend to be a purist when it comes to restoring swords, especially ancient Japanese swords, so I still find it hard to imagine using anything but original, or authentic materials. Regardless, let me know what you think, your feedback is always welcome.